This exhibition honours the special significance that written forms hold across the many unique cultures of Asia – a vast geographical area boasting an enormous diversity of languages and writing systems. Each case features rare texts and diverse forms of bookmaking that highlight the prominent role of writing and calligraphy found across Asia. Encompassing Chinese, Japanese, Arabic, Farsi, Tibetan, Sanskrit, Prakrit, and Gujarati scripts, the works invite you to explore a range of cultural or sacred practices that find expression in the written word. These works provide a glimpse of the ingenious ways in which Asian writers have blurred the boundaries between the textual and the visual realms, creatively deploying script to communicate deeper layers of meaning that go beyond words themselves. 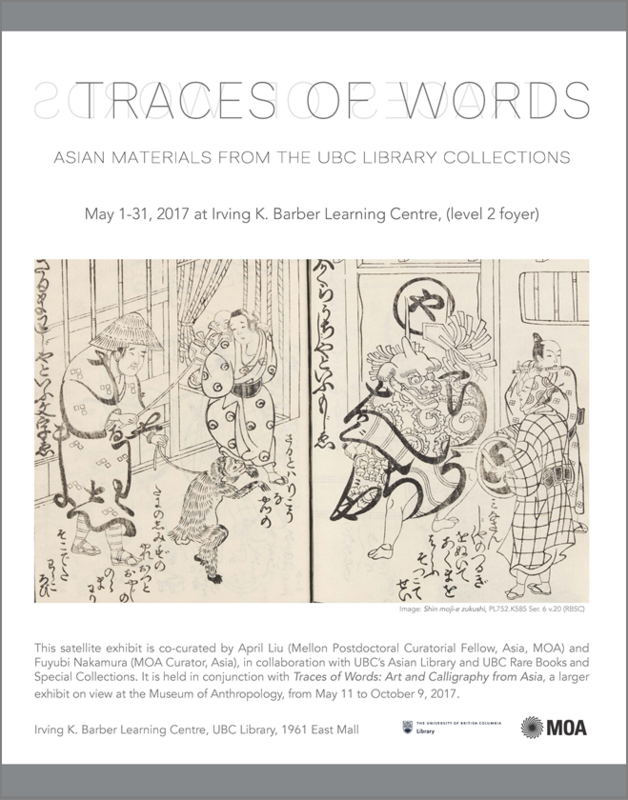 All of the extraordinary texts on display belong to the collections of the UBC’s Asian Library and Rare Books and Special Collections. This satellite exhibit is co-curated by April Liu (Mellon Postdoctoral Curatorial Fellow, Asia, MOA) and Fuyubi Nakamura (MOA Curator, Asia), in collaboration with the UBC’s Asian Library and UBC Rare Books and Special Collections. It is held in conjunction with Traces of Words: Art and Calligraphy from Asia, a larger exhibit on view at the Museum of Anthropology, from May 11 to October 9, 2017. As part of the 44th Annual Conference of the Canadian Association of Information Science (CAIS), Jennifer Preece, Professor of the College of Information Studies at University of Maryland will be hosting a discussion about the new challenges for Information Studies in this period, known as the anthropocene. Humans are now having a profound influence on the planet, changing the atmosphere we breathe and reshaping the earth’s surface, thereby triggering species extinction at an alarming rate. Information Studies professionals and students can have a profound influence on the data that is collected, how it is stored, retrieved and communicated with citizens and communities. We have a responsibility to help to heal our planet by raising awareness and triggering action. This talk challenges researchers, practitioners, teachers and students to lead the way in shaping a sustainable future. We can change information processes and technology, raise awareness, and engage citizens to contribute to science and their own communities by becoming “citizen scientists”. This event happened on November 9, 2016. Jennifer Preece, co-author of Interaction Design: Beyond Human Computer Interaction (4th Edition, 2015), helped to define research on online communities through her book Online Communities: Designing Usability, Supporting Sociability, 2000. Her current research focuses on information processes and technology for supporting citizen and environmental science; with an emphasis on community participation for collecting biodiversity data. 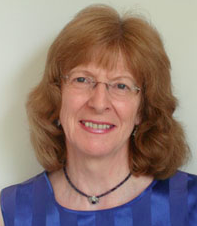 Preece was dean of the College of Information Studies – Maryland’s iSchool for ten years from 2005 – 2015. Click here for further information about her career. In collaboration with the Public Scholars Initiative (PSI), the IKBLC Community Engagement & Programs division presents the “PhDs Go Public Research Talk Series,” which showcases doctoral students telling their community-engaged research stories in just under seven minutes. In “Human(e) Interactions with the Environment,” nine PhD students from UBC’s Public Scholars Initiative engage the public by using the Pecha Kucha format to present on how their research is contributing to the public good, and making a change in the world. This year’s PSI themes include education, environment, culture, social justice, and health. This event happened on Wednesday, 15 March 2017. Featuring readings by Shani Mootoo, Lydia Kwa, and Larissa Lai and a discussion of the film All Our Father’s Relations by Elder Larry Grant and Sarah Ling. The event was part of “Worlds at Home: On Cosmopolitan Futures,” a public symposium bringing together scholars from across Canada, the US and Australia to consider the future of cosmopolitanism as a critical approach to scholarship and praxis. The symposium took place on UBC’s Vancouver campus from March 16-17, 2017 and featured an interview with Dr. Sneja Gunew (UBC) and a launch of her book, Post-multicultural Writers as Neo-cosmopolitan Mediators (Anthem Press) as well as a keynote address by Dr. Pheng Cheah (UC Berkeley) and more. In “Explorations in Culture and Diversity,” eight PhD students from UBC’s Public Scholars Initiative engage the public by using the Pecha Kucha format to present on how their research is contributing to the public good, and making a change in the world. This year’s PSI themes include education, environment, culture, social justice, and health. This event happened on Thursday, March 23, 2017. The Institute for the Scholarship of Teaching and Learning (ISoTL) is excited to host Professor Dragan Gasevic, Chair in Learning Analytics and Informatics from University of Edinburgh, to talk about State and Directions of Learning Analytics Adoption. The analysis of data collected from user interactions with educational and information technology has attracted much attention as a promising approach for advancing our understanding of the learning process. This promise motivated the emergence of the new field of learning analytics and mobilized the education sector to embrace the use of data for decision-making. This talk will first introduce the field of learning analytics and touch on lessons learned from well-known case studies. 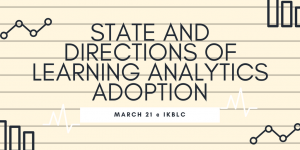 The talk will then identify critical challenges that require immediate attention in order for learning analytics to make a sustainable impact on learning, teaching, and decision making. The talk will conclude by discussing a set of milestones selected as critical for the maturation of the field of learning analytics. capacity development at institutional levels through the inclusion of diverse stakeholders is essential for full learning analytics adoption. Registration Required: At this time we require everyone – UBC affiliated or otherwise – to register for the CTLT events system. If you already have a CWL please sign in. However, if you do not have a campus-wide login, then please register for a BASIC cwl account (you will see basic as the bottom option on the 3rd screen). Dragan Gasevic is a Professor and the Chair in Learning Analytics and Informatics in the Moray House School of Education and the School of Informatics at the University of Edinburgh. As the President (2015-2017) and a co-founder of the Society for Learning Analytics Research (SoLAR), he has had the pleasure to serve as a founding program co-chair of the International Conference on Learning Analytics & Knowledge (LAK) in 2011 and 2012, general chair of LAK in 16, founding program co-chair of the Learning Analytics Summer Institute (LASI) in 2013 and 2014, and a founding editor of the Journal of Learning Analytics. Computer scientist by formal education, Dragan considers himself a learning analyst whose research centers on learning analytics, self-regulated and social learning, higher education policy, and data mining. The award-winning work of his team on the LOCO-Analytics software is considered one of the pioneering contributions in the growing area of learning analytics. Recently, he has founded ProSolo Technologies Inc. that developed a software solution for tracking, evaluating, and recognizing competencies gained through self-directed learning and social interactions. He is a frequent keynote speaker and a (co-)author of numerous research papers and books. Please join us for an exploration of cultural humility and what it means for how we teach and learn. 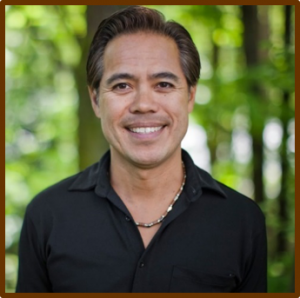 We will hear from Dr. Evan Adams, Chief Medical Officer of the First Nations Health Authority and a trailblazer in promoting cultural humility within the healthcare system. With humour and wisdom, Dr. Adams offers insights into the journey of cultural humility and how this ongoing process of learning and reflecting can strengthen relationships and improve outcomes. Participants are welcomed and encouraged to engage in this interactive session to advance the dialogue on cultural humility and learn from one another’s journeys. 1. Explore the meaning of cultural safety and cultural humility. 2. Reflect on the role of cultural humility in your work – how can cultural humility enhance experiences in the classroom? In this session, we’ll explore ideas of scholarly practice in the digital age and how they can inform or be applied to teaching and learning. How has scholarly practice changed and what are the possibilities that open practices and platforms open up when students and faculty members become co-creators engaged in meaningful, generative work? 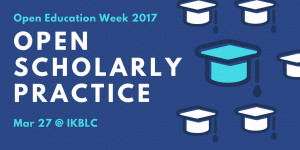 We’ll look at emerging practices at UBC that are engaging students as producers of knowledge using open platforms to align classroom spaces with scholarly practice. Research Day showcases the contributions of the iSchool students and faculty working at the intersections of archival, information, library and children’s literature studies. Questions about social media as sources of information about individuals (of different ages, genders, backgrounds) and communities, their uses in our personal and professional lives, and impact on our practices and overall well-being are central to the work of students and scholars across all our iSchool programs. Recognizing this common ground, this year’s Research Day will focus on the broad topic of “information, social media, and well-being,” considering the many connections social media now have with the way we do information, library, and archival studies. This event happened on March 10, 2017. Dr. Lyle Ungar is a Professor of Computer and Information Science at the University of Pennsylvania, where he also holds appointments in multiple departments in the Schools of Business, Medicine, Arts and Sciences, and Engineering and Applied Science. Lyle received a B.S. from Stanford University and a Ph.D. from M.I.T. He has published over 200 articles, supervised two dozen PhD students, and is co-inventor on eleven patents. His current research focuses on developing scalable machine learning methods for data mining and text mining, including spectral methods for NLP, and analysis of social media to better understand the drivers of physical and mental well-being.